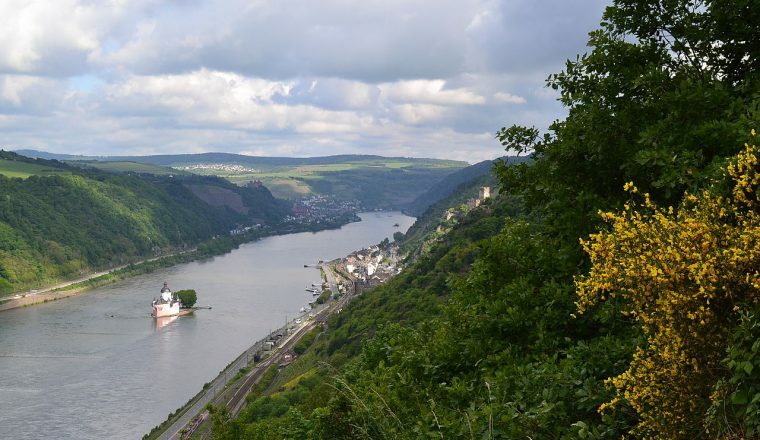 The Rheinsteig trail runs along the right bank of the river Rhine between Bonn, Koblenz and Wiesbaden leading to forests, vineyards and spectacular views. 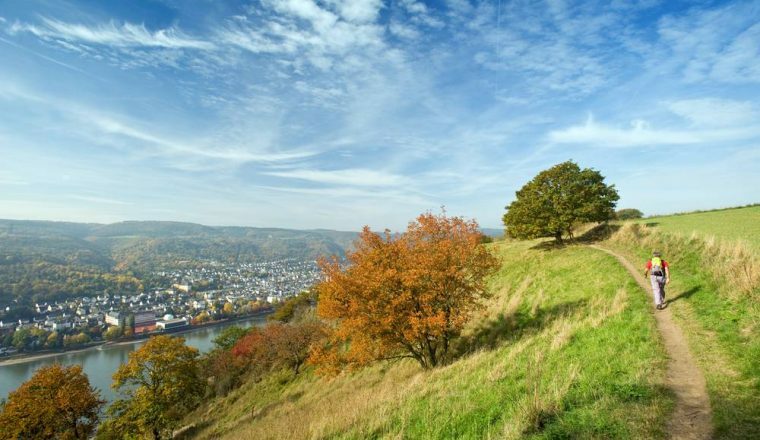 The Rheinsteig trail runs along the right bank of the river Rhine between Bonn, Koblenz and Wiesbaden leading to forests, vineyards and spectacular views. This exceptionally well sign-posted and closely networked trail offers the opportunity to explore the landscape and culture of Germany in all its comparatively undiscovered glory.This is the entire Rheinsteig trail from Wiesbaden to Bonn, with each section done back to back in one holiday.It can easily be reached by train, boat and car and is near several airports. You must be able to walk the distances mentioned and deal with a significant amount of hills and cliffside paths. On most days the walk will take you up from the riverside to the path above. A head for heights is also essential. Arrival at Wiesbaden and overnight. The Baroque palace of Schloss Biebrich, located on the banks of the river, is an idyllic backdrop for the start of your walk along the Rhine Valley. The Rheinsteig follows the river, passes the harbour of Schierstein, before ascending away from the river for the rest of the day to the Rheingau Hills. Pass the restored keep of a medieval castle at Frauenstein, with good views from the Goethestein viewpoint. 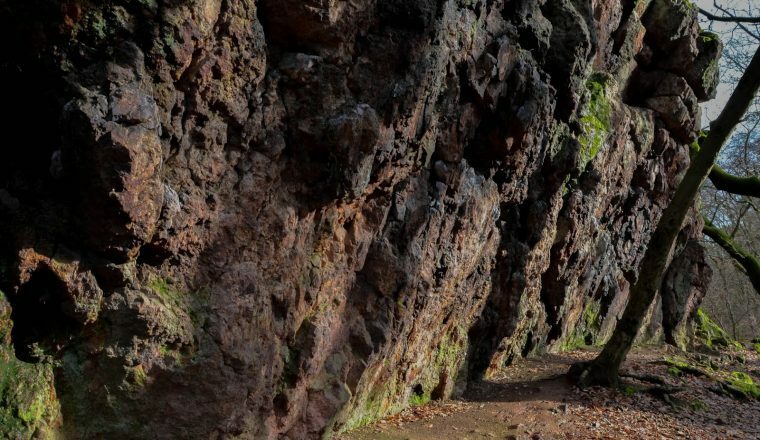 Narrow paths through the forest to reach the mighty rock formation of the Grauer Stein. Schlangenbad, hidden in a narrow valley, is a traditional thermal spa. Return to the Rhine through forest, orchards and Rheingau vineyards. A fine view of the Rhine Valley near the ruins of Scharfenstein castle before you come to Kiedrich village, a medieval gem and home to Germany’s oldest playable organ. Ascend Honigberg hill, pass the monastery of Kloster Eberbach (location for the film “The Name of the Rose”) and a venue for connoisseurs of wine. Pass Steinberg, Eberbach’s best known vineyard location, enclosed by a 3 km long stone wall. The path continues through woodland, meadows and vineyards, along the hills above the Rhine and the wine-grower’s villages of Hallgarten and Oestrich-Winkel. 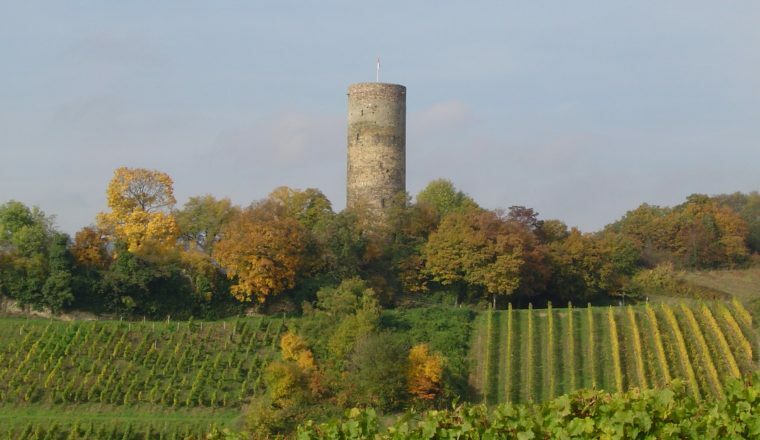 As on the previous day, the Rheinsteig trail repeatedly meets the “Rheingau Riesling Path”. 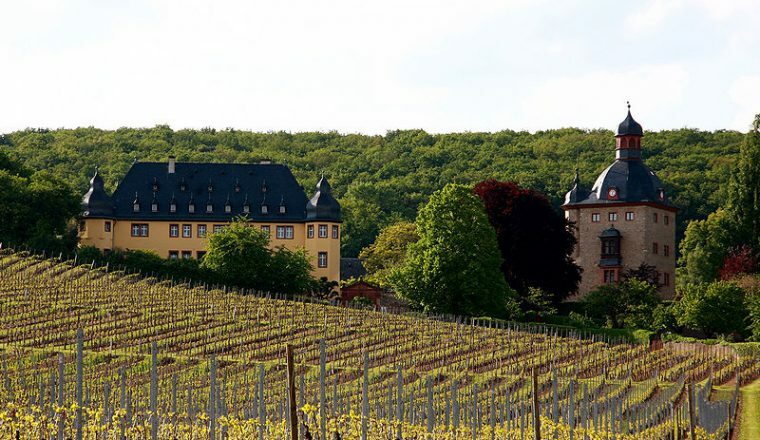 Idyllically surrounded by vineyards, the palace of Schloss Vollrads is the next traditional place for Rheingau wines – tasting possible here. 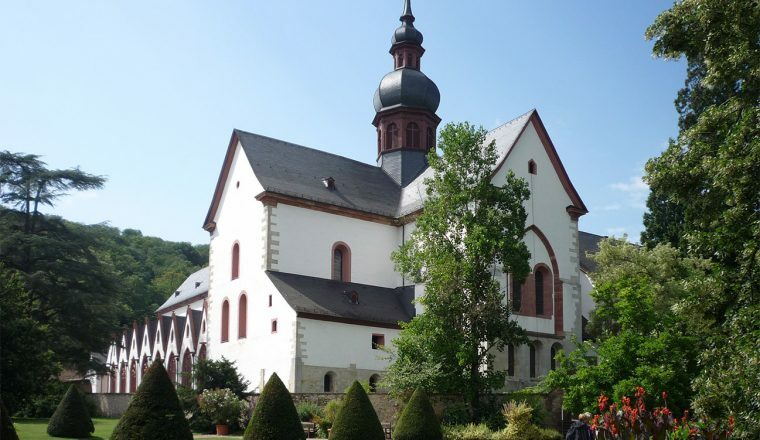 An initial ascent through the forest is followed by a steep passage downhill to the Elsterbach valley, the location of the Kloster Marienthal monastery, a popular place of pilgrimage. It is only a short way to the next cloister, Kloster Nothgottes, followed by the abbey of St. Hildegard. The day ends at the massive Niederwald monument near Rüdesheim. Many brilliant views of the Rhine Valley to Bingen, where the river Nahe flows into the Rhine. A walk through the artificial tunnel passage of the Zauberhöhle (magic cave) is followed by the steep descent to Assmannshausen by the river before ascending again. 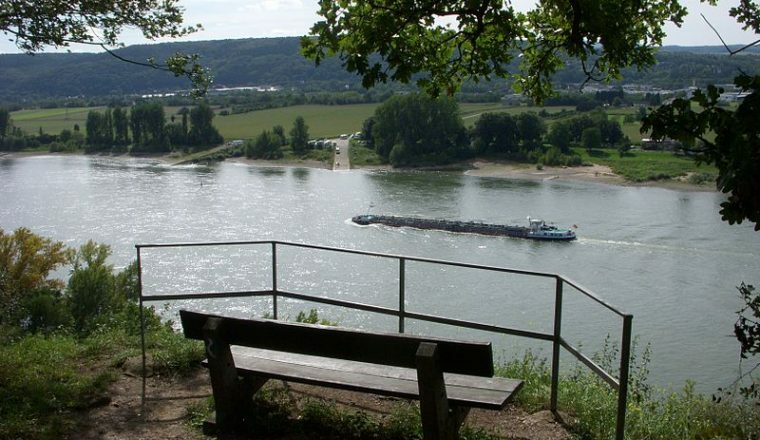 Narrow and rocky paths lead you along the slopes of the Rhine Valley, crossing small valleys before having another classic view at the Drei-Burgen-Blick viewpoint (“Three Castles View”). A steep descent down to Lorch, where a single row of houses lines up along the bank of the Rhine for over three kilometres. 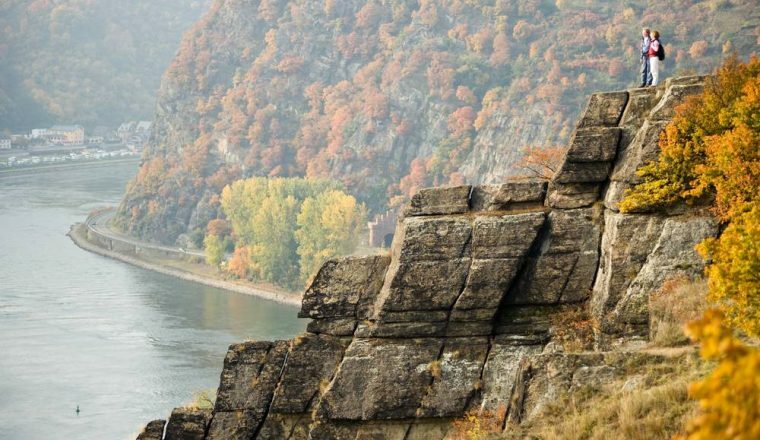 The Rheinsteig trail leaves the state of Hesse and the Rheingau region, taking you to the state of Rhineland-Palatinate. The course of the walk is close to the Rhine, often directly along the slope of the Rhine gorge, with excellent views of Bacharach and Burg Stahleck castle at the Wirbellay viewpoint. In the Volkenbach valley note the the fortified castle of Pfalzgrafenstein scenically located on a small island in the middle of the river. This challenging stage is one of the highlights of the entire trail. It closely follows the Rhine from above, with an abundance of dramatic views, including of the Loreley rock near St.Goarshausen. You ascend and descend a succession of smaller valleys After passing Burg Katz castle above St. Goarshausen, a final climb to the Patersberg hill is worth the effort, because it adds one last highlight to the many others of this great stage taking you to another “Three Castles View”. From the Hasenbach valley the Rheinsteig trail goes steeply uphill again, leading you on narrow and natural paths along the slopes of the Rhine. 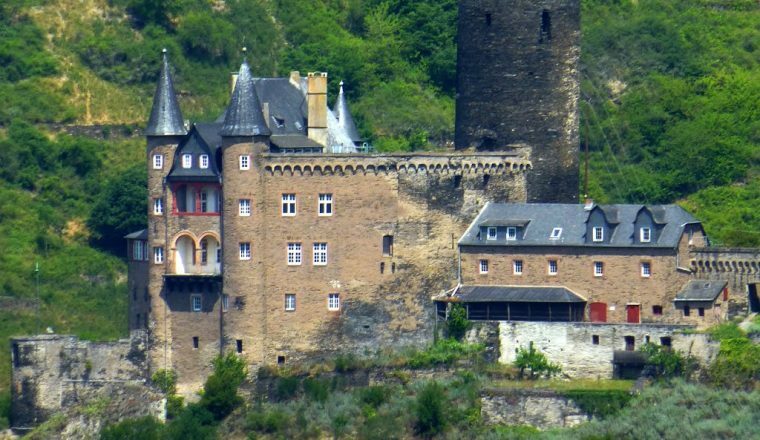 The imposing Rheinfels castle is on the other side of the river, just above St. Goar, whilst Burg Maus castle is located on the path. Starting at Wellemich, a 5 km mining trail shows the region’s history of slate quarrying and ore extraction. A wonderful view at the Hindenburghöhe is followed by Liebenstein and Sterrenberg castles, the ‘warring brothers’. Descent into Kamp-Bornhofen for overnight. Today follow the long bend that the Rhine describes between Osterspai and Braubach. 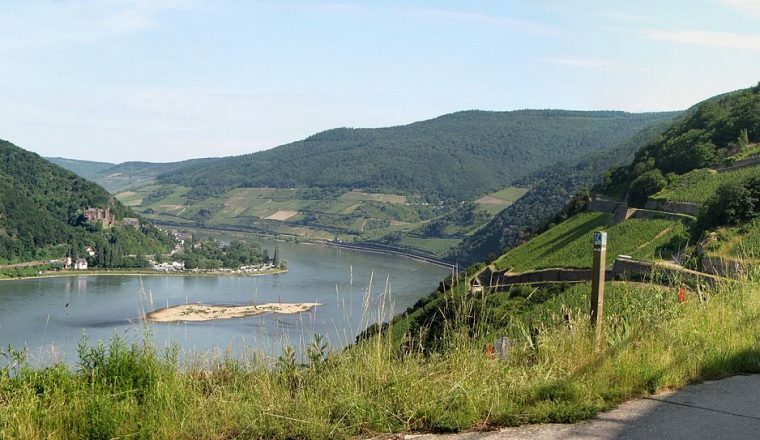 Again, the route stays close to the river, repeatedly providing you with great views of the scenic Rhine Valley which reach as far as Koblenz and Lahnstein. The path is often rocky and narrow, taking you along the cliffs, over the hills, and several times downhill into river valleys. 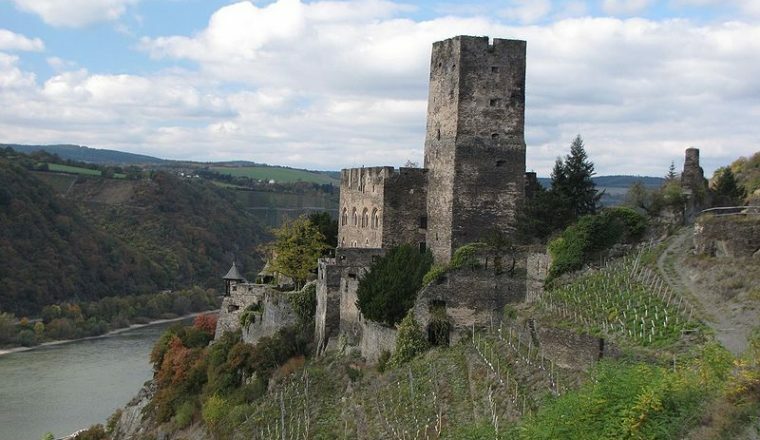 Marksburg castle is picturesquely situated on a hilltop. From here you walk downhill to Braubach, filled with ancient, half-timbered houses, idyllically located at the riverside. The way leads you away from the Rhine, passing remains of the local mining history. From the Kerkertser Platte (plateau), the trail continues via rocky stretches over hills and through small valleys. The Rupertsklamm is a wild gorge which has been deeply cut into the landscape by the water. The way uphill, which is fairly strenuous, is an area of diverse fauna and flora. From above the gorge the views go down to the narrow valley of the river Lahn and to Lahneck castle, seated high above the river. 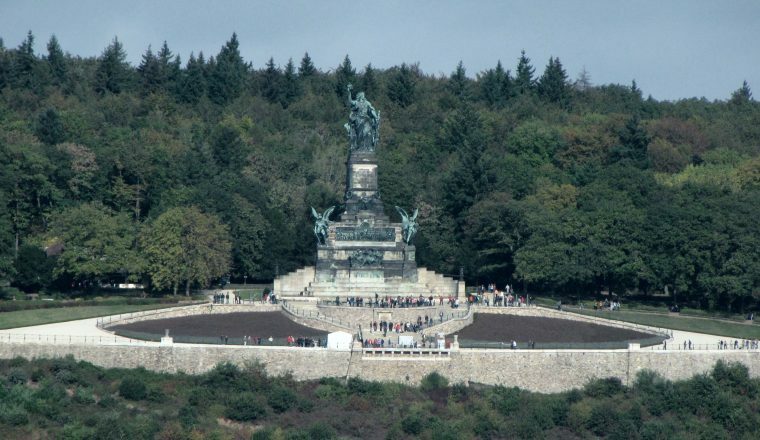 From Lichterkopf hill, there are panoramic views from an observation tower. The trail passes more woodland, eventually taking you downhill, back to the Rhine, through the nice Bienhorn valley. Along the riverbank, the way leads to Ehrenbreitstein, a part of the city of Koblenz on the right-hand side of the Rhine and dominated by the mighty fortress of the same name. Leading you uphill right after the start, the Rheinsteig trail passes the imposing fortress of Ehrenbreistein. From the hills, there are good views of Koblenz, where the rivers Rhine and Moselle flow together at the “Deutsches Eck”. Pass through the idyllic valley of the Mallendarer Bach and after that through the partly boggy Wambach valley to Vallendar. Directly opposite of the town, the village of Niederwerth is idyllically located on an island in the Rhine. The Rheinsteig trail leaves the river behind for a while, taking a swerve to the hilly forestland of the Westerwald. The way passes the Meerbach valley, quickly taking you uphill to the historic Wüstenhof Inn. A varied route passes wooded valleys and nice hilly meadowland on the way towards Sayn, where there is a reconstructed Roman watchtower at the Pulverberg hill. Overnight Bendorf. The Rheinsteig trail continues the detour through the Westerwald. As you walk along the edge of the forest, there are good distant views overlooking the lowland plain of the Neuwied basin. The trail continues on paths through the forest and passes remains of the Roman Limes as well as another reconstructed watchtower on Wingertsberg hill. Then uphill to the climatic health resort of Rengsdorf, where the Rheinsteig trail has reached its maximum distance from the river. An attractive and varied stage leads back from the forested hills of the Westerwald to the banks of the Rhine. The route crosses an area of hills and idyllic valleys, including the Laubach valley with its waterfalls. The Römergraben, near Rengsdorf, is a mighty medieval defence wall. The way is mostly through forest, open country and orchards. The final descent to the Rhine is a little difficult, but offers wonderful views of the river. At the Hüllenberger Stolperstein you see Andernach on the left bank of the Rhine, before a path leads you steeply downhill to the pretty wine village of Leutesdorf. The trail comes to Arenfels Palace, which is scenically situated between the vineyards of Bad Hönningen. Then, a lovely stretch leads back to the Rhine, where the trail passes the small wine grower’s village of Ariendorf. The scenic town of Linz am Rhein, also known as the “colour town on the banks of the Rhine” because of its many coloured, half-timbered houses, is where you overnight. Ockenfels castle is the next spot with a good view overlooking the Rhine Valley, and this is followed by another, extremely scenic view at the Erpeler Ley. This stage takes you out of the state of Rhineland-Palatinate, to the Siebengebirge Hills, in North Rhine-Westphalia. The hilltops of the Siebengebirge nature reserve are of volcanic origin, and you pass some of the most famous ones. You walk along broad forest tracks, along vineyards and across fields. After crossing the Breitbach valley, the way ascends to the highest hills of this stage, Auge Gottes (“God’s Eye”) and Leyberg, with views of the Siebengebirge and the Rhine Valley. 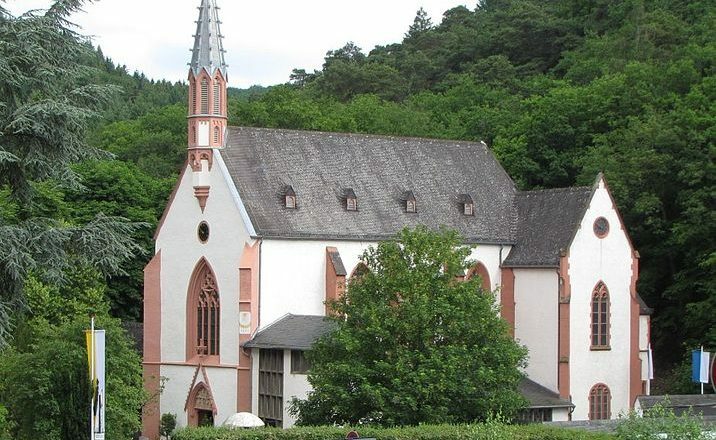 A last downhill passage passes through a small valley, taking you to Bad Honnef, located on the banks of the Rhine. This is quite a hilly stage, over the rounded hilltops of the Siebengebirge and through several deep valleys. An initial climb to the Himmerich and Wingstberg hilltops is followed by a path leading down into the Ohbach valley. Another steep climb to Löwenburg castle begins, and there are wide views from the castle ruins, just above the Rheinsteig. 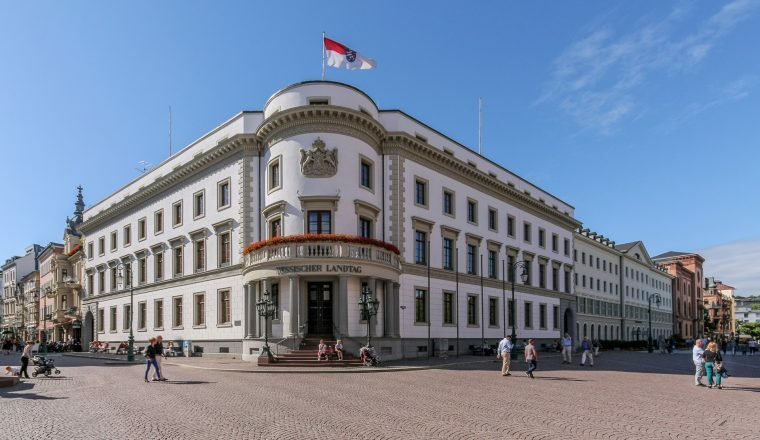 The trail leads downhill again and passes Rhöndorf, once the home of former German chancellor Konrad Adenauer. A wonderful view of the Rhine Valley near Rhöndorf, before the last climb of the day begins to the famous Drachenfels hill with the ruins of a medieval castle and a viewing platform. Pass the palace of Schloss Drachenburg and the Nachtigallental valley, then Geisberg hill. Cross a valley, then go steeply uphill again to Petersberg Hill. In the valley again, the route passes the park of the Heisterbach Cloister, dominated by the striking and much painted ruins of the choir of the former cloister church. Overnight Heisterbach. Final opportunities for views of the Rhine from above, from the vineyards of Oberdollendorf and elsewhere. Then the Rheinsteig eventually brings you to the riverbank. With views of Bonn’s former government buildings on the other side of the river, a long stretch of the way leads through an extensive park along the Rhine. Crossing the Rhine via Kennedy Bridge for the first time during the entire long-distance trail, the Rheinsteig soon reaches the centre of Bonn, where the walk ends on the scenic town hall square. Overnight Bonn.